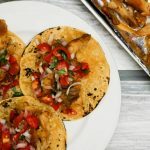 These easy Grilled Chicken Tacos are a staple in our house since we literally would be happy eating tacos every night. Lately, we have been rotating between this recipe, these simple Steak Tacos, and this yummy Taco Soup. It’s healthy Mexican at its best and is sure to make the whole family happy. Making grilled chicken tacos in the summer is something we do all the time whether it is for our own dinner or when we have friends over. Not only is it really easy, it’s also super cost effective since you don’t need as much protein per person when everyone is stuffing it into taco shells and loading it up with salsa and fixings. Served alongside some slow cooker pinto beans and rice, it’s a really great way to throw an affordable party and everyone will leave full and happy. To serve these chicken tacos, I like to set up things up buffet style and let everyone build their own tacos, salads, nachos, burritos, or bowls. It may sound complicated, but it’s actually quick and simple, especially if you let the grocery store help with some shortcuts. I always start with a couple types of salsa, usually opting to have one mild, one medium, and one hot. For the mild, I almost always serve pico de gallo and then use a homemade or store-bought red and green salsa to round things out. After that, I offer a bunch of chopped veggies – cilantro, onion, lettuce, tomatoes, and avocado. Finally, I set out the tortillas, chips, rice, and beans. Normally I will make the rice and beans but there are some good store-bought options as well. Then just let everyone build their own. It’s easy, budget-friendly, and chicken tacos taste good room temperature so you don’t have to worry about keeping everything piping hot. If I am doing this for a family dinner, I will just do a smaller version of what I included above based on the things we eat the most. And I always make extra for leftovers. 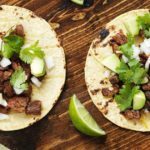 These keep great in the fridge and the leftovers work for so many different recipes – quesadillas, burritos, taco salads, and more. Taco seasoning for chicken is something you can quickly make at home using spices you already have in your pantry. It can be used as a dry rub or combined with lime juice to make a marinade. You can adjust the heat level by adding cayenne or red pepper flakes to add more spice. This recipe makes enough for 1-1.5 lbs. of chicken. Directions: Mix together the spices to use as a dry rub. Add the juice of 2 limes or oil to use as a marinade. You can make a larger batch of the spice blend and store it for up to three months as well. How much taco seasoning per pound? Generally, you will want about two tablespoons of taco seasoning per pound of meat. This could shift depending on the strength of the taco seasoning and the level of spiciness. Always start with less, since it is much easier to add more and impossible to remove it. 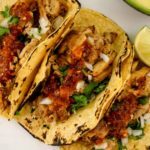 What kind of chicken is best for grilled chicken tacos? The best options for grilled chicken tacos is to use boneless skinless chicken breasts or thighs and it is really a matter of personal preference. Chicken breasts are leaner, lower in fat, and zero points for those on Weight Watchers. However, chicken thighs have a higher fat content, which means they will stay more moist and tender. You don’t have to worry about chicken thighs drying out as much, so for anyone new to grilling, they may be a safer option. And if you are watching your budget, chicken thighs are usually about half the price as chicken breasts. Quesadillas: Grab canned black beans, canned corn, pico de gallo, cheese, and your leftover chicken for the best quesadilla filling. You can use traditional flour tortillas or a low carb option for a lighter meal. Lettuce wraps: For a light and healthy lunch, wrap up your leftover grilled chicken in lettuce wraps with avocado, cheese, and salsa. Add canned black or pinto beans to make it more filling. Taco salads: Everyone loves a good taco salad and this chicken works great as the protein. Top it with a spicy ranch by combining light ranch dressing with your favorite salsa. Chicken tortilla soup: Grab a can of vegetarian tortilla soup in the store and top it with this grilled chicken, fresh avocado, and some cheese. 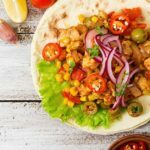 Burritos: My kids love burritos so for an easy lunch I stuff whole grain tortillas with this chicken, beans, rice, and veggies. If we are having it for dinner, I will top the burritos with canned enchilada sauce and cheese to make wet burritos, one of our favorites. Barbecue Chicken Sandwiches: We love spicy barbecue so tossing this slightly spicy chicken with your favorite barbecue sauce and stuffing it into sandwiches is a great way to create a whole new dinner.